Knitters know well that there are always lots of temptations around. Usually it's yarn or a pattern. More and more often it's a knitting trip, retreat or festival. Here's one that I just learned about - Inverness Loch Ness International Knit Festival. I've been to this area, cruised on Loch Ness (no monster spotted). The Scottish Highlands are beautiful. This is on at the same time as Shetland Wool Week. And speaking of Shetland, here's a book that I learned about from a friend. She picked up a copy at the recent Vogue Knitting Live event in New York City - another tempting knitting event. 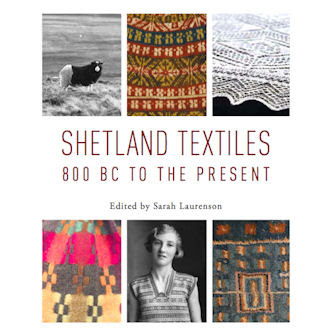 The title is "Shetland Textiles 800 BC to the Present" and is available at the Shetland Heritage Shop. Closer to home: if you're in Canada and close to a Superstore, you might want to check out the housewares department. They have bags that I'm sure knitters will love. They come in two sizes and are priced at $30 and $35 (Canadian). In the Calgary store, NE, near the Sunridge mall - there were also a few dishes with knitting patterns on them. I saw a little cream and sugar bowl. That's all for this time. I'll post News Bits from time to time as I spot or learn of new things of interest.